I do collect makeup bags especially if they have quirky designs and are unique. 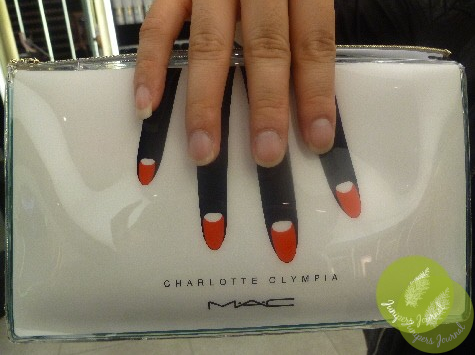 MAC Charlotte Olympia Makeup Bag is a custom-designed makeup bag that doubles as a clutch. Clear PVC bag features a charming retro-inspired hand design, turquoise accents and Charlotte’s signature golden spider’s web as the zipper pull. This bag is big and spacious enough to fit makeup brushes and a number of makeup products. In any case, it makes a really nice clutch which will turn people’s heads and get them asking you about it but it as this is a collaboration with a renowned shoe and bag designer, it is priced at RM116. This is such a cute and creative design!